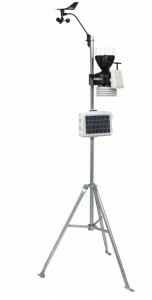 The easy-to-use, affordable, remote field monitoring system for making critical crop decisions. EnviroMonitor is a revolution of precision agriculture: it gathers intelligence by measuring, monitoring and managing critical field data related climate, irrigation, and crop production. Add almost any sensor you choose to suit your needs and microclimate. Sensor data is gathered over a secure, self-optimizing, self-healing network. EnviroMonitor will let you create a system precisely suited to deliver the information you need. With your micro-climate data in the Cloud, you'll be able to access it from your PC and mobile devices. Our WeatherLink.com site allows you to customize your dashboard, perform in-depth analysis with reports, charts and graphs, export data and much more. Easily access your data with Mobilize, our free, intuitive, decision-making app that puts field data in your hands. Customize your screen views, quickly browse sensor data, view forecasts, frost information and alarm set up and more. The EnviroMonitor Gateway collects all data from the Nodes and pushes it securely to the Cloud using cellular connectivity. Connect Davis' accurate and reliable sensors, as well as third party sensors such as flow meters, pressure switches and more, to an EnviroMonitor Node. You can connect up to four sensors per node. These sensors are compatible with the EnviroMonitor Node.